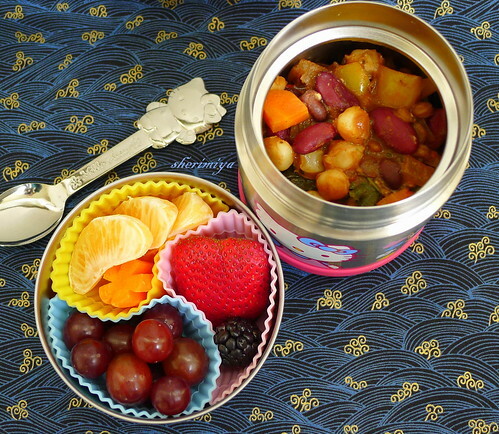 Bean and Hominy Chili Bento, a photo by sherimiya ♥ on Flickr. Heat oil in a pot over medium-high heat. Add onions and peppers; sauté until soft and golden brown, about 5 minutes. Add chili powder, cumin and oregano: sauté until fragrant, a minute or so. Add beans and hominy along with broth and tomatoes. Add the rest of the vegetables and lentils. Bring to a simmer, reduce heat to low and simmer, partially covered, until vegetables are tender and flavors have blended, about 40 minutes. Stir in garlic, chocolate and cilantro; simmer a couple of minutes to blend flavors. Turn off heat and let stand a few minutes if there's time. Adjust seasonings and serve. Ooh that recipe looks lovely, as does the bento as usual :)) ! Where did you get it from? d.a.f.fodil, it's a recipe from Pam Anderson (not THAT Pam Anderson) - she's a meatless cookbook author. I'll edit in the recipe so you can see it. Thanks! Amazing! You are doing meatless week! I highly doubt if I can completely avoid meat for even a week as my husbands kids highly depend on eating all kinds of meat. I think they eat vegetable like 1/3 of meal and 2/3 are meat dish. Not so healthy I think as I try myself to eat minimum 1/2. I just found your blog and I must say your bentos are awesomely cute! Especially the Totoro ones (which I'm planning to make for my 45 y.o. kid... err...husband). Your kids must be so grateful to have such a creative mom! Good job! Are you trying to be vegetarians? I tried it and I loved it until I went to MX(San Carlos, Sonora on the ocean) and I got really sick. That was the end of the vegetarian life style. Medically I'm not allowed to anymore, but I just don't eat as much meat, :) and absolutely no veal. Nami, my husband doesn't mind cutting back on meat, and the kids didn't seem to mind - as long as it was tasty. But I can see how it would be hard to introduce meatless meals to a family that is used to lots of meat! I think as long as they consume veggies as well, it's healthy and balanced to eat meat. We certainly will continue to enjoy our favorite chicken wings and ma po tofu (among others), but I hope to keep up my occasional vegetarian repertoire. In fact I purchased this thermal jar at Target; they have a pretty big selection to choose from. Thanks a lot for commenting! Anon, thanks very much for your kind words. I'm happy you found the site and think it's great to make cute Totoro bento for kids of ALL ages! In fact, I wish someone would make one for me :D Have a great day! Cat, we aren't becoming vegetarians; it might be a bit drastic for this family that loves certain meat dishes. However, I'd like to learn to make vegetables and beans more of the main part of the meal on occasion. It takes some planning to make sure it will be substantial enough to satisfy everyone. This recipe is great. I usually add ground meat of some kind to chili, but you don't really miss it here. There is no MSG. I'll add the recipe to the post soon so you can try it yourself. I hope you and your family will love it too! I am actually very carnivorous ;), but I wouldn't mind having this bento because it looks so delicious! I love the bento box too, I don't have any thermal bento boxes yet, I should try to get one, I can imagine how lovely it would be to eat something warm like this, especially in winter...! Mm, we could so eat this today. It's -17ºc here, feels more like -30 actually. lol. This looks so hearty even without the meat. I actually prefer it that way most times. I'd love to add barley rice with this too. So yummy! Chantale, -17?! I can't even fathom that temperature. Barley is awesome! Live winter for letting I enjoy hearty meals, at least. Heh. Thanks!